We are a nationally and internationally renowned brass band, playing in the 'Championship Section' (Brass Banding's 'Premier League') of the UK Band Structure. We perform regularly on the leading concert and contest stages. The group consists of 30 members with 12 playing musicians; our Supporters Club is over 1000 strong. We employ a professional part-time Music Director - our current MD, Paul Andrews, has been with us since 2013, and has overseen a rise up the international and national brass band rankings. Wingates Band is a very famous name in banding, and is respected throughout the country for its 'pedigree', consistency and high standards. The band has won 7 British Open Championships; 4 British National Championships, more… The band will achieve an unrivalled 100 years of recording history in 2015 - our CDs are an important part of the bands revenue generation. 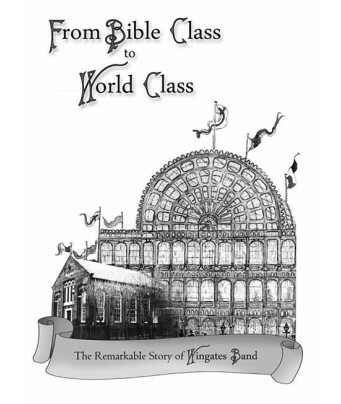 As part of our 140th anniversary celebration in 2013, a definitive history of the band is was researched and written by band President David Kaye – 'From Bible Class To World Class'. 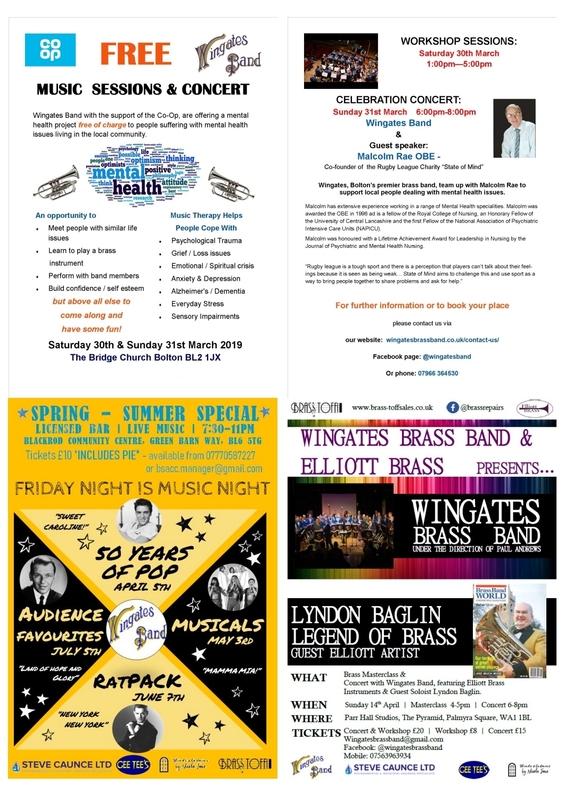 Wingates Band prides itself in being part of Westhoughton life and a contributor to community events such as The 100-year Pretoria Remembrance (2010), Luddites Bi-Centenary Celebrations (2012) organised by Westhoughton Local History Group. We also take pride in raising the profile of Westhoughton, often performing alongside our friends The Houghton Weavers. The very popular 'Folk and Brass' concerts with the two 'Westhoughton Legends' take place twice a year, usually May and September – a combination that works very well. Our folk friends celebrating 40 years in show business in 2015. Through networking with WCN we are looking to create a heightened awareness of the 'Jewel' in our midst and what Wingates Band has meant to Westhoughton's heritage and culture for over 140 years. To communicate with the community - raising the band's profile to generate support at concerts; grow our supporters club membership; find, recruit and encourage talented young musicians, and strengthen the backroom team. We have a band-room at Wingates Square (BL5 3PS); a venue steeped in history that has been used as for some WCN meetings, much to the delight of the network and in keeping with its sharing and learning spirit. Subject to availability Wingates Band, or smaller Brass Ensembles, are available for events and functions. We now have a permanent display or information and artefacts upstairs at Westhoughton Library, allowing residents and visitors a chance to see and learn more about the brass band. A history that is both rich and traumatic; with a few that both challenges and provides great optimism. As well as performing concerts, Wingates Brass Band is a competing band with all of the costs involved - practice time, instruments, travel & accommodation, as well as maintaining the band hall. The band needs to generate income and sponsorship to keep going, continue to compete, to bring through new talent and musicianship, and to maintain its status as one of the world's top 30 brass bands - and one of the most enduring. Your contribution and support can make a big difference, helping the band survive and grow. At just £20 a year, membership entitles you to: monthly email updates; a quarterly newsletter; a membership card and a free invitation to the Christmas concert (or an alternative non-charity concert). The band continue to be busy, rehearsing, performing and taking part in competitions. 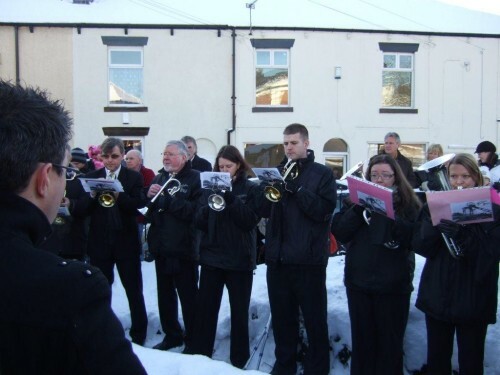 The band also continues to support the local community in Westhoughton and Bolton by performing at on the streets (busking), events or making the Band Hall available for occasional meetings. The start of the year has been eventful! (Feb 2018 Newsletter.) The survival of the band has taken centre stage with a number of avenues being pursued to help steady the ship. A 'Heritage Lottery' bid is being researched for the prospect of a capital grant to try and save the band hall (refurbishment) or obtain a grant for a total re-build with a value-added community facility dimension. The band overwhelmed by the support on such fundraising by local partners, with this critically important project, particularly that afforded to the band's Treasurer. Wingates Band are now members of 'The Art's Council', so can actively pursue grants for the arts, etc. A tie-up with the Co-op's Community Fund, having been selected as a Member's beneficiary organisation this year, means a project to help sufferers of P.T.S.D. via musical therapy sessions. Special thanks to the 'Provincial Walsh Trust' for Bolton who gave the band a donation to support running costs. And of course the new Supporters Club is up and running, and going well. 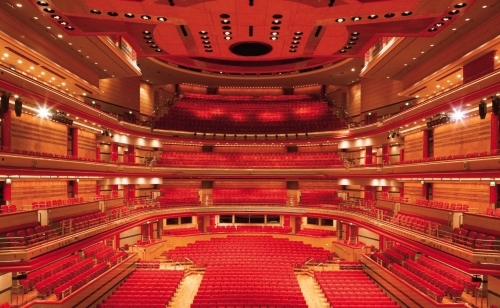 The concert schedule continues… after a local rehearsal at The Hub, Wingates Band is back at the Symphony Hall Birmingham on Saturday, 8th September competing against 18 of the top brass bands in the country at 166th 'The British Open'. "The Open aspires to preserve the established custom of encouraging new compositions to extend and question the boundaries of brass music, and to provide enjoyable challenge to participants, and absorbing entertainment for the audience." All bands play the same piece, this year it is 'A Brussels Requiem', a challenging piece that reflects on the tragic circumstances that arose from the series of terrorist attacks in the Belgian in 2016. Adapted to reflect similar attacks in the UK and Europe, presented in four interlinked movements entitled 'Innocence', 'In Cold Blood', 'In Memoriam — We Shall Rise Again' and 'A New Day'. Judging is done 'blind', based on 10 categories, each scoring 1-20 points: 1. Pitch/correct notes; 2. Rhythmic accuracy and clarity; 3. Tempi; 4. Dynamic range; 5. Ensemble precision; 6. Tuning/intonation; 7. Sound quality; 8. Balance; 9. Quality of soloists; 10. Artistic expression/musicality. Last year's champions, Valaisia Brass Band from Switzerland return to defend the title… Winners 7 times, the last time our local band won was in 1975. A pre-event review of bands from all4brass. How did Wingates Band do this time? A creditable 15th, consolidating their position back amongst the brass banding elite and something to build on for next year. Results. Valentines/Contest Preview Concert, Blackrod - 11th Feb.
North West Area Contest, Blackpool Winter Gardens - 25th Feb.
Over Hulton Conservative Club - 11th March. Warrington Parish Church of St Elphin - 17th March. Whit Friday March Contest, Tameside & Saddleworth venues - 25th May 3:00pm. 14th Annual Prescot Festival of Music Concert - 22nd June 7:30pm. Floral Hall, Southport (with Sefton Schools Music Service) - 29th June 7:00pm. 'Open' Rehearsal, The Hub - 1st Sept (7:00pm). Free. 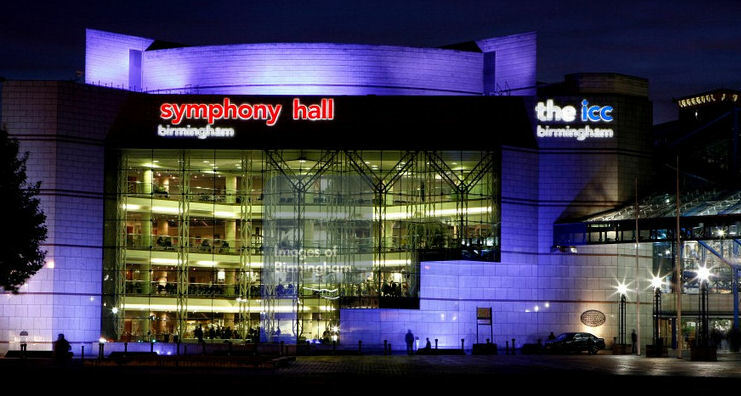 'British Open' Contest, Symphony Hall, Birmingham - Sat 8th Sept all day. Last Night of the Ribble Valley Proms, Chatburn, Clitheroe (with James Bond) - Fri 14th Sept 7:30pm. £10 [01254 384893]. Concert, Christ Church, Padgate, Warrington - Sat 13th Oct 7:30 pm. WWI Commemoration Concert, Blackrod Community Centre - Sat 3rd Nov 7:30 pm. Mayor's Charity Concert, Brookfield Hall, Westhoughton - Thurs 8th Nov 7:30 pm. £12 [WTC 01942 819802]. Remembrance Parade, Astley Bridge (end of WWI Remembrance) - Sun 11th Nov 10:00am. Scottish Open Contest, Perth - Fri 23rd to Sun 25th Nov.
Christmas Concert with The Three Town Operatics Society, Victoria Hall, Bolton - Sat 8th Dec 7:30pm. £5 / U12 free [Tkts]. Christmas Concert at St John's Wingates, Westhoughton, Bolton BL5 3PP – Thurs 13th Dec 8:00pm. A Fond Farewell - David Kaye Retires From Band After 25 Years. Tony Smith's Book inspires a musical show. 90 Years On - Wingates Band Still Featuring On National Airwaves. Christmas Concert by Wingates Band & Houghton Weavers. More Contest Success and a Lightning Storm! A year of unprecedented activity saw the culmination of several projects and celebrations to mark such a unique milestone for the Westhoughton-based brass band. Wingates Band even got a mention in the House of Commons - recorded in Hansard (17 Oct 2013 : Column 905) - when then MP, Julie Hilling spoke to the House about the 140 years, the book and anniversary concert. 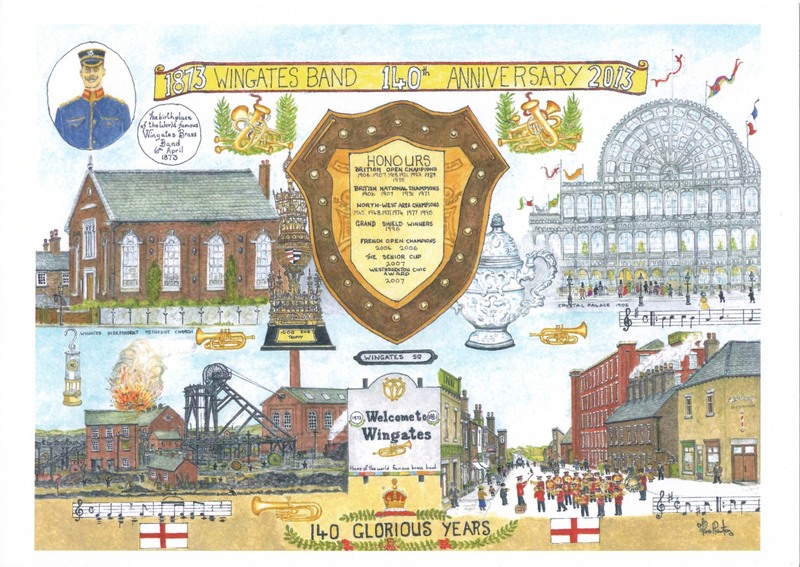 Local artist, Tom Newton MBE, produced a water-colour collage - 140 Glorious Years - featuring various aspects of the band's long and colourful history, and association with Westhoughton. The artwork featured on posters and post cards used to raise funds. October saw the publication of the first-ever book telling the full and fascinating story of Wingates, from its establishment in the middle of Queen Victoria's reign, through until the present day. A labour of love, compiled and written by the band's president, David Kaye, the book entitled 'From Bible Class to World Class' chronicles the modest beginnings from a most humble drum and fife ensemble playing chapels and local fêtes to a band which achieved widespread acclaim for its astonishing 'double-double' in 1906 and 1907, when Wingates were crowned as both British Open and British National champions. A story of dedication, enthusiasm and the aspirations of the bandsmen, most of whom worked the local mills and mines - at the time led by William Rimmer, one of the all-time legends of the banding movement (1891 to 1909). 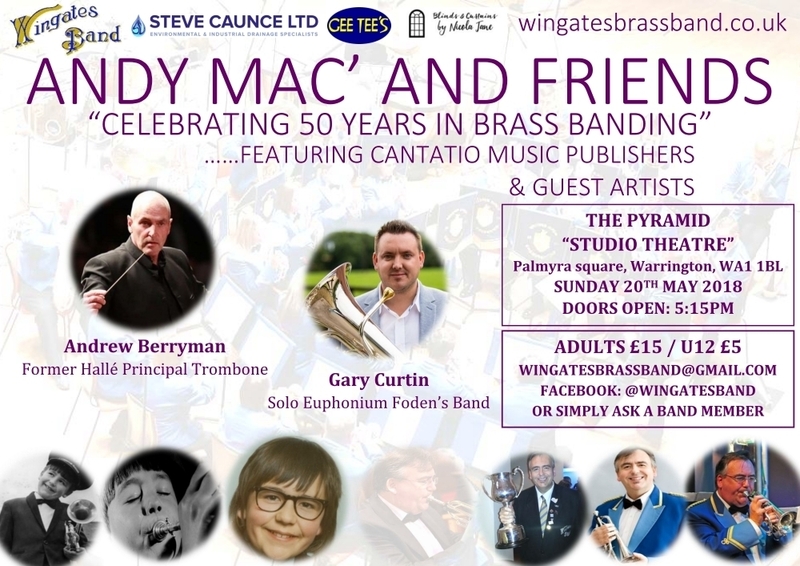 With a total of 7 British Open and 4 British National Championships to their credit – along with numerous other accolades and achievements – the Wingates Band story is indeed one of triumph – but of trauma too. In 1910, at the height of the band's fame, its very future was seriously threatened in the wake of the horrific Pretoria Pit Disaster (Britain's third worst coal mining disaster of all time, with 344 victims), as a result of the loss of many players, including the driving forces of chairman and secretary. However, Wingates Band is a true survivor, and despite the trauma of Pretoria, and the horrors of two world wars – not to mention quite a few financial crises! – many glorious chapters have been written in the band's story throughout the century and more since the desperately dark days of 1910. 'From Bible Class to World Class' include chapters chronicling the life of the band on the concert and contest platforms, its national and international tours, its long broadcasting and recording pedigrees, appearances before royalty etc. – and more than a sprinkling of Wingates trivia! The book (£12.95) is available locally at Westhoughton Library or can be ordered via the Wingates Band website or by contacting the band (below). Wingates Band working in conjunction with Bolton's Libraries and Museums Service on the 'Band History' project, a 4-tier glass display of Wingates Band artefacts and items of memorabilia has been set up in Westhoughton library on permanent, designed to highlight key aspects of the band's wonderful story, and a brochure has also been published to complement this display. From its formation in 1873, the display a microcosm of the wonderful Wingates story since mid-Victorian times until the present day, featuring sections showing highlights of the band's story, including a profile of Wingates successes on the contest platform, an outline of the band's concert and touring history. There is a feature commemorating the most traumatic event in the band's 14 decades - namely the Pretoria Pit Disaster, in 1910. The exhibits will be expanded and updated to reflect the Wingates Band ongoing history and importance and significance to Westhoughton. A renown that stretches across the region, country and world. The display was augmented by the publication of an informative brochure, available to visitors of the library. Musical director Andrew Berryman worked on a project to produce a commemorative CD album, to feature music from all 14 decades of the band's wonderful history, whilst a second album (although not directly linked to the 140th anniversary), featuring music composed entirely by the band's renowned Composer-in-Residence, Lucy Pankhurst, was being produced. In October a high-profile Celebration concert, at which the Anniversary CD album and history book were officially launched, took place. 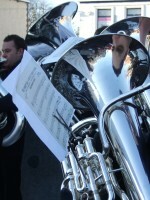 Special guest players at the Victoria Hall concert included euphonium stars David Thornton, Gary Curtin and Lewis Musson – all former Wingates principals – for whom the band's composer-in-residence, Lucy Pankhurst, was commissioned to write a new euphonium trio composition, premièred at the concert. Other celebratory events also included a nostalgic reunion dinner, to which all former Wingates players were invited.